old explanation of settings while ST has a concept of rooms it seems to be more of a grouping mechanism. in contrast rooms occupancy considers the room as a meta device and automates a few common tasks associated with a “room” physical or virtual. in keeping with that it has attributes, capabilities and commands which are useable in webcore or other smartapps like Smart Lighting. however, what makes it useful for me is not just the room’s state but the abiloty to manage automation for room in one set of settings for the room. when adding a room device through the smartapp you are able to configure settings for the room which allow the various devices in the room to be automated based on these settings. a quick note on occupied and engaged states. think of occupied as a transient state and engaged as a persistent state. occupied is you go to a room are in there for a few minutes then leave the room. lights come on when you enter the room and turn off after a couple of minutes of your leaving the room. engaged is when you stay in a room for an extended period of time and may be motionless for some or all of the time. since we cant depend on the motion event for engaged state there are different options to set the room to engaged for extended occupancy. these are all under engaged settings and there is more coming. but these help make sure the switches you set to on stay on even if there is no motion in the room. when in engaged state you have a different and longer timeout state than the occupied state. so there is still a motion requirement but a much higher time threshold than transient occupied state. if away modes are selected, rooms will change to ‘vacant’ state if they are in either the ‘occupied’ or ‘checking’ state when location changes to any of the away modes. if motion sensors are selected, rooms will change to ‘occupied’ state on motion if they were previously ‘vacant’. if switches are selected, when room changes to ‘occupied’ the switches will be turned on. if motion timeout in seconds is selected the room will be changed to ‘vacant’ after last motion inactive + motion timeout seconds. if 2nd group of switches are selected, when room changes to ‘vacant’ the switches will be turned off. this is only a part of what’s possible. 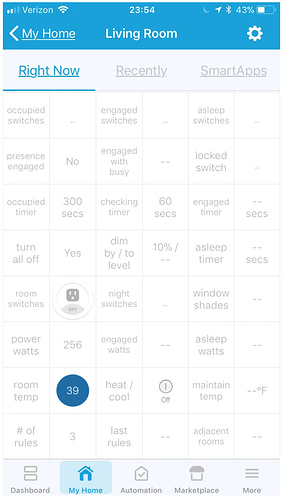 please take a look at the settings for a room in the child-app that captures all of these settings to get a sense of what else is possible. these are very common tasks around rooms which most users go through automating at some point, so also posting here in case others find this useful. *   2) sunrise & sunset now support offset in minutes. so if you always wanted sunrise -30 or sunset +30 now you can. *   1) added setting for locked state timeout setting. *   2) on motion active added check for power value to set room to engaged instead of occupied. *   3) on occupied switch check power value to set room to engaged instead of occupied. *   4) on contact close check for both occupied and checking state to set room to engaged. *   5) for motion inactive with multiple motion sensors check all sensors for active before setting timer. *   2) added rule name to display in rules page. *   3) added support for power value stays below a certain number of seconds before triggering engaged or asleep. *   4) added support for vacant switch. except this sets room to vacant when turned OFF not ON. *   5) changed speaker device to music player in the rooms setup. *   6) added support in rules to control window shade. *   1) added support for switch to set room to locked. *       by comma and one of them will be randomly picked when making the annoucement. *   3) added support for switch to set room to asleep. *   1) added support for power value to set room to asleep. *   1) added rules support for maintaining temperature. *   1) added one page easy settings for first time users. *   1) added variable years to date filter. *   1) added switches for occupied state and corresponding settings by https://github.com/TonyFleisher. *   2) added setting to keep room in engaged state based on continuous presence and not just presence change. *   3) refactored how another room engaged works and checks for continuous presence before reseting room state. *   4) added resetting of asleep state to engaged state reset. will probably make that an option later. *       starting the work to change maintain room temperature to use rules. *   6) added another optimization when getting rules to allow getting conditions only. *   7) move is busy check to motion handler instead of downstream. *       a) if matching rules have no lux and no time all of those rules will be executed. *           executed. if there are multiple matching rules with the same lux value all of them will be executed. *       c) if matching rules has time all rules that match that current time will be executed. *           value and matching time all of them will be executed. *   9) timer indicator now uses minutes when time is over 60 seconds. *   10) fixed a few small bugs here and there. *   1) updated device tiles layout and added a bunch of indicators. *   2) added checking state to room busy check. last release of 2017 … happy new year everyone! *   1) added option to temporarily override motion timers with rules. *   2) added support for button to set room to asleep. *   3) added checks for interval processing of rules. *   4) some optimizations and bug fix. *   2) added support for room AC and heater support to maintain room temperature. support for thermostat is coming. *   3) moved all stanalone devices to their own settings page. *       the door is engaged or occupied instead of when the door is closed. *   5) added support for button to set room to vacant. *   6) moved webCoRE_init call to the bottom of the updated() method. *   7) couple of bug fixes. *   1) added support for variable text for arrival and departure announcements. *   2) added support for power level to set room to engaged. *   1) added support for arrival and departure announcement. *   2) added support for speaker control through rules and use of speaker to set a room to engaged. *   3) bug fix to stop truncating temperature to integer. *   1) added support for wake and sleep times to calculate level and color temperature. *   2) add support to process rules every 15 minutes so switches state/level/color temperature is updated. *   3) fix for continuous motion with motion sensor. *       to be set based on local sunrise and sunset times. this does not yet use circadian rhytym based calculation. *   2) added support to reset room state when another room changes to ENGAGED or ASLEEP. *   3) removed lux threshold support from main settings since this is now available under rules. *   4) fixed presence indicator for device display. *   5) added support for multiple engaged switches. *   6) added undimming for lights. *	7) added support for centigrade display. *   8) added support for multiple presence sensors. *   9) couple of bug fixes. *       on VACANT state is skipped instead the rules are checked and executed for the VACANT state. *   2) some bug fixes. the rules create much more flexibility in when switches are turned on and off or routines are run controlled by these rules. before creating rules please give the room a name and save it. then go back in to the room and edit the rules. the rules use the app state and without the room created the app state is not available to the app for use. if you are using Rooms Occupancy with say wC note that “occupancyStatus” is now called “occupancy”. there is no impact if used from ST app only. sorry for the breaking change. *   1) changed name of 'occupancyStatus' to just 'occupancy' to be consistent with ST.
*           when room changes away from asleep. *   1) added support for room busy check. *   2) added support for arrival and/or departure action when using presence sensor. *   3) some bug fixes. @johhnwilliam will probably add more details about the sleep sensor integration when he is back from his sleep. awesome to have @johhnwilliam contributing to the project! *   1) added setting to select which days of week this rooms automation should run. *           motion change room state to vacant. *      ii) if there is motion in an adjacent room you can turn on lights in this room if it is currently vacant. *           this allows for the adjacent rooms feature to be used as a light your pathway can kind of setup. *   1) revamped device details screen. if users dont like it will revert back. *           group of switches instead of just switches off. *   3) added option to change state directly from engaged to vacant without moving to checking state. *	4) removed last event from status message. *   1) added last event to status message. *           timeout while room indicates its vacant. *           to be turned on or off. *           present the room automation should work normally. *   2) added support for modes which when set cause all automation to be bypassed if location is any of those modes. *   1) added support for contact sensor. when contact sensor changes to closed room will be set to checking state. *           engaged which stops room automation from kicking in till the contact is opened again. *           when contact sensor changes to open room will be set to checking state so automation can resume again. *           the only exception to this is home changing to away in which case room will be set to vacant. *           motion sensor becomes inactive and room is in occupied or checking state. *           motion in the room within the timeout period the room will be set to engaged stopping automation. *   5) added lights control with lux for engaged state. *   6) added button push to toogle room state to engaged or checking when room state is already engaged. *   more. see the wiki for more details. (note wiki is still in progress. ok there is really no content in the wiki. heres a few things i have added to the DTH/smartapp since i posted this. feedback welcome. *           those devices in the turn on switchs list that support it. *           use motion inactive event and instead timeout on motion active event for predictable user experience. *   3) added support for dimming before turning off light. *   4) added support for color setting which takes preference over color temperature if the switch supports it. *   5) fixed small bugs. *       a) if lux value falls <= that value and switches on are selected those switches will be turned on. *       b) if lux value rises > that value and switches off are selected those switches will be turned off. *       c) switches on with motion will be turned on only when lux value is <= that value. *   2) fixed small bugs. Pass device list as arguments? not sure i am following … this is on the ST app home page? if yes, i am not seeing the issue. if you give me some more details i will try to reproduce. if no, please clarify and i will dig in to it. thanks. owner: adey / name: bangali / branch: master should work. support for multiple away modes. i have seen at least a couple of wC users that use more than one. subscription for motion devices so if room is vacant or checking and there is motion move room state to occupied. added support for switches which will be turned on or off when room is changed to occupied or vacant respectively. automation happens only for states ‘occupied’, ‘checking’ and ‘vacant’. for now i am choosing to stay away from automating anything when the room is ‘reserved’, ‘locked’ or ‘kaput’. also these automation only happens if user picks a corresponding mode or device when specifying app preferences so its optional. there is another reason for not automating the last three states. thats if you want the switches automation to work most of the time but not always then changing the room state to reserved will stop the automation from turning off the switches till the room state is changed back to one of the first three. i dont have that coded yet but thats the plan. *            only if room is in occupied or checking state. *   2) added subscription for motion devices so if room is vacant or checking move room state to occupied. *   3) added support for switches to be turned on when room is changed to occupied. *   4) added support for switches to be turned off when room is changed to vacant, different switches from #3. *            supported by ST Smart Lighting smartapp. [DEPRECIATED]....... Post Withdrawn By Author!
. owner: adey / name: bangali / branch: master should work. i cant seem to get your github details to work??? i only get that error if your info is on my list… if i remove your info then it works for all the others??? right, possible that i havent followed some step in the github repo setup … so, checking. for now, are you able to add it manually? 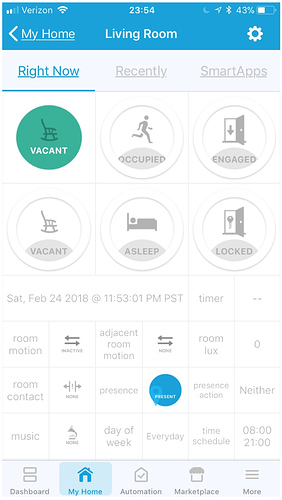 It doesn’t seem any existing rooms are displaying on the Rooms Manager Smartapp once created. This is either after I updated to the new version or if I uninstalled all of the existing rooms and reinstalled from scratch after Smartapp was removed too. It does seem to work though after adding a room but it won’t show on the Smartapp. so it adds the rooms occupancy as a device but does not show in the rooms manager smartapp? Correct but it didn’t show existing rooms for me either after I updated as well initially after having rooms created on old version. i just tried with a fresh install, seems to get all the rooms that i create to show in the list. is this only happening when you update from an old version to this new version? but, everything created in the new version shows fine? update from github is now fixed. just did a fresh install from github and created a couple of rooms, everything is showing for me as it should. are these rooms that were previously created by an earlier version of the smartapp or these rooms were created after reinstalling the smartapp? hmm … trying to reproduce. are you able to delete both the apps / DTH and rooms then install via github update repo and see if that works? thanks. Really odd, updated the Smartapps and DTH using GitHub update on IDE and it’s working now.